The Pharisees and the Herodians were desperately trying to shut down Jesus’ momentum. With a simple message of love and hope, he was changing the world right before their eyes, and they were smart enough to realize that their power would be useless in this new world of overwhelming mercy and grace. Without their carefully constructed and strategically distributed judgment and condemnation, their power structures would topple into shambles. One sure way to put an end to the public’s enamored response to Jesus was to simply remove him from the scene – dead or alive. In truth, it didn’t much matter to them. Simple enough, right? We’re supposed to pay our taxes. End of story. Hmm. If that is the point of this story, I have to admit that I find it a little wanting. After all, it is shared in Matthew, Mark, and Luke. Surely there is more to it than that. Maybe the point is to show that Jesus saw through the religious leaders’ antics. That’s a little more satisfying if you’re looking for Jesus in the role of intellectual champion, but I think there has to be more here. Let’s take a closer look. Jesus asked to see the image on the coin and then delivered his verdict about taxes. 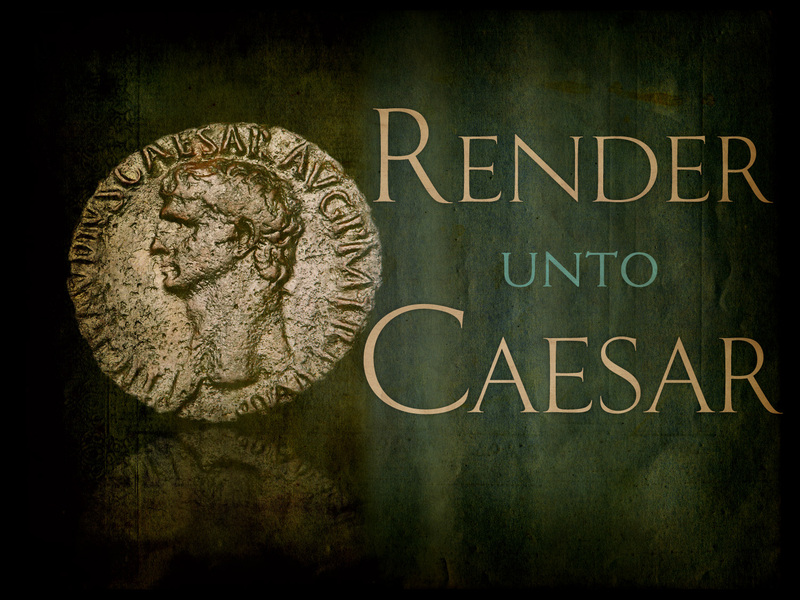 If the image on the coin was the basis for paying the Roman tax, where was the image supporting the instruction to render unto God what is God’s? Jesus didn’t ask for a coin, a prayer cloth, a candle, a lamb – nothing. Where was the image identifying the thing that must be rendered to God? I get that the image of God stood before them in the body of Jesus, and that body would be rendered unto God in a most sacrificial way. But was that the only image of God present that day? Wasn’t Jesus also saying something about the people before him and their role in God’s kingdom? Standing before the young students and looking into each face one by one, Jesus softly turned the imprinted coin over and over again in his palm. Once again, they had missed the point. The heart of his teaching was not stamped on the face of the coin. It was stamped on the face of each and every one of them standing before him. They were created in the image of God – stamped, marked, impressed with his image. Wouldn’t any of them render unto God that which was God’s? Or would they go on using their role in this world to misrepresent who he really was? As Jesus pondered these things, they all walked away. The opinions published here are strictly my own and do not represent those of my employer or any other entity.